A sustainable landscape solution that starts nourishing your soil from day one! Gone are the days of needing to choose between a stunning landscape and healthy soil. A mix of organic material and humus, Mineral Mulch starts nourishing your soil from day one. 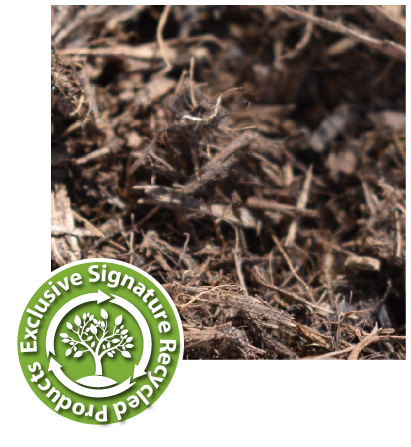 As part of our signature line of products, Mineral Mulch is made onsite from local yard debris. Start your sustainable landscape today! Contact us for current pricing and availability. We all know that organic mulch nourishes your soil. However, did you know that this process is typically very slow? In fact, it only occurs as the mulch begins to decompose. Luckily, there is another option. That option is Mineral Mulch. A combination of organic yard debris and humus, Mineral Mulch is naturally fortified with minerals that start nourishing your soil from day one! Mineral Mulch adds value, style, and nutrition to any sustainable landscape or garden project. It is dark in color and comparable to chocolate and brown colored mulch. However, despite its dark coloring, Mineral Mulch contains no dyes or other additives! In fact, both its stunning appearance and its nutritional properties are the result of an all-natural composting process. In addition to providing nourishment to your soil, Mineral Mulch, like other organic mulches, also provides weed suppression. It does this by blocking out the sun. Another benefit of this process is the fact that it reduces watering costs by helping your soil retain moisture! Being sustainable shouldn’t make you break the bank! Luckily, Mineral Mulch is a sustainable solution for both your landscape and your wallet. As with all of our signature recycled products, we keep the prices competitive and generally lower than the more “traditional” counterparts.